Early morning seems to be the best time to be out there. That’s a cool dragonfly shot, I can never get up close enough and mine are decidedly less colorful! Yes, I love the quiet of early morning in the garden. The dragonfly was a lucky shot–didn’t have much time before it flew away. Amazing dragonfly pictures! And he’s a very handsome critter. Thanks. That was a nice dragonfly and I could never catch sight of him again so glad those two pictures turned out. What a fantastic dragonfly, he is so handsome! Early morning is the best time in the garden before it gets too hot and the light is much better for photos. Your salvia is beautiful too. Thanks Pauline. I haven’t seen many dragonflies this year so was happy to get a couple of photos. Yes, early morning in the garden is very best. Lovely early morning shots of beautiful plants. That dragon fly is amazing, I thought he was a garden ornament at first. What a gorgeous Zinnia. I must grow some next year. Thanks Chloris. 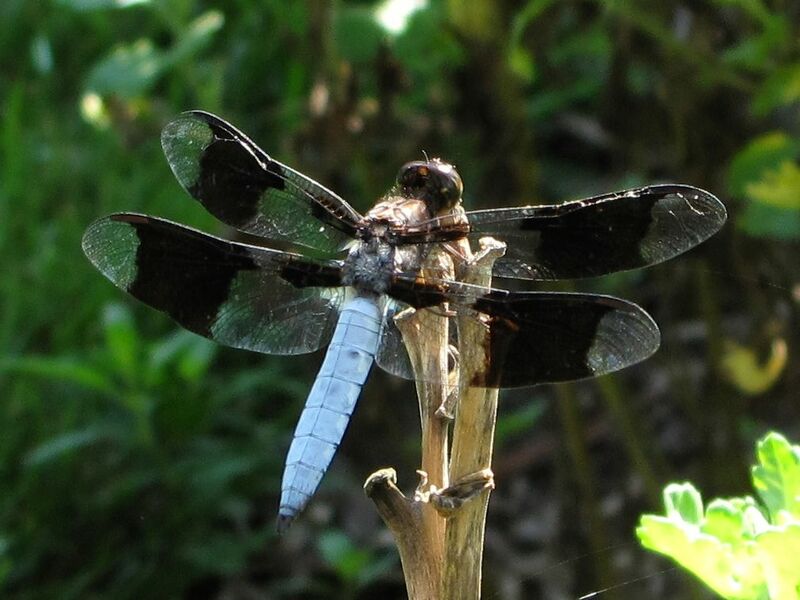 The dragonfly chose an old dried up daylily stalk to perch on, but he didn’t like it when I tried to get closer. The zinnia is remarkable at this early stage. I think ones like this must be opening up pink eventually. Does your Euphorbia grow in full sun? I have good luck with spurge in shade. 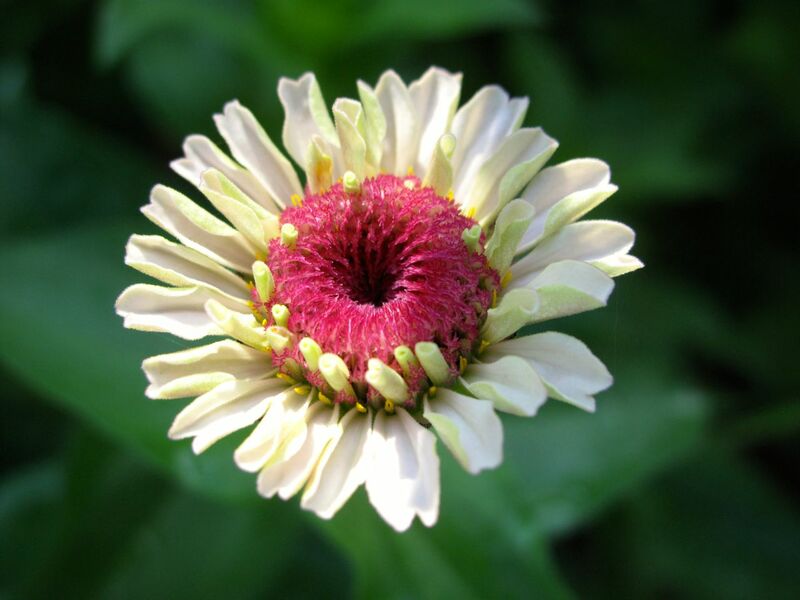 Love the zinnia; I’ve never seen one exactly like that. Yes, the Euphorbia is in a pot on the patio in full sun. I don’t have much shade, but in the old Chapel Hill gardens Euphorbias are under the huge old trees. Have been reluctant to plant it out into the garden as I’ve read it can spread and also that they can cause an allergic reaction in some people. Have you had any problem with either? It’s been interesting to seethe the things that were affected by the harsh winter. Some of the plants look fine, then have hardly any flowers. The zinnia is beautiful- such unusual colors. Were affected by the cold winter at all in FL? My gardenias are still struggling but I think they’ll recover. I’m in Chicago and the winter really did a lot of damage to many plants. Thankfully it hasn’t been an equally harsh summer so most things have had a chance to recover. Whoa! I was way off. Glad your plants are getting a chance to bounce back Stephi. 🙂 Many times I wish I was in Florida. The Zinnias look like something to add to my list for the cuttings garden, the one you show is beautiful. I like to be in the garden early too, either to work or to take photographs. The zinnias are one of the few things adding color in my garden right now, although it took them until mid-July to open. Should last until early Oct though. 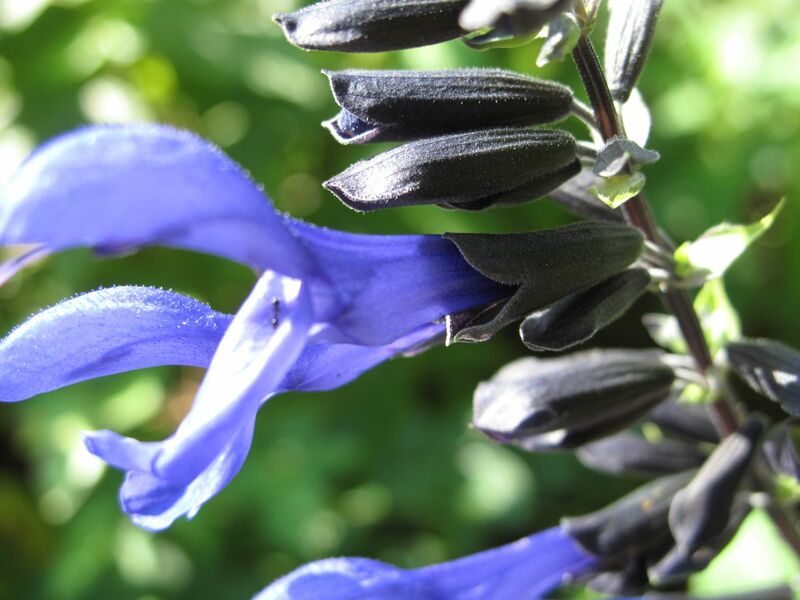 A lovely salvia Susie. And a nice shot of the dragonfly. We occasionally get them in our garden too, although there’s no water here. 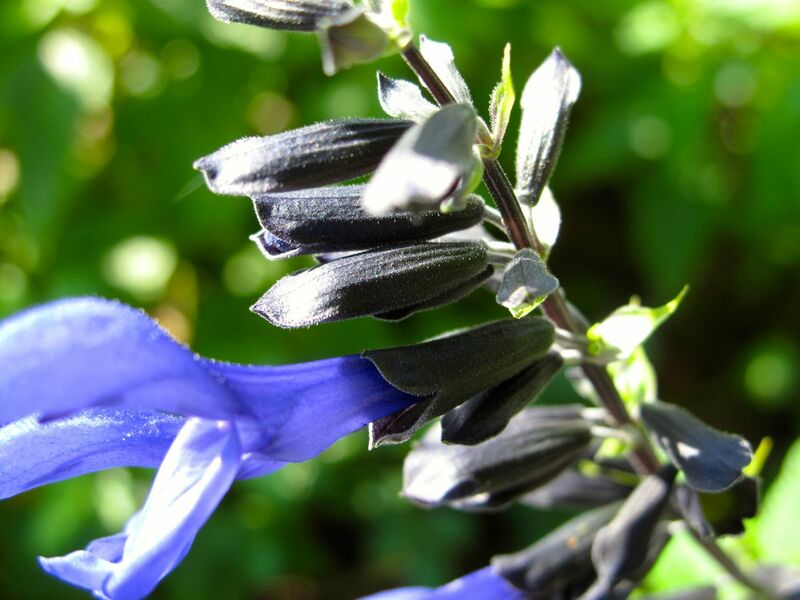 Cathy I love that black and blue salvia but it’s not very happy this summer. 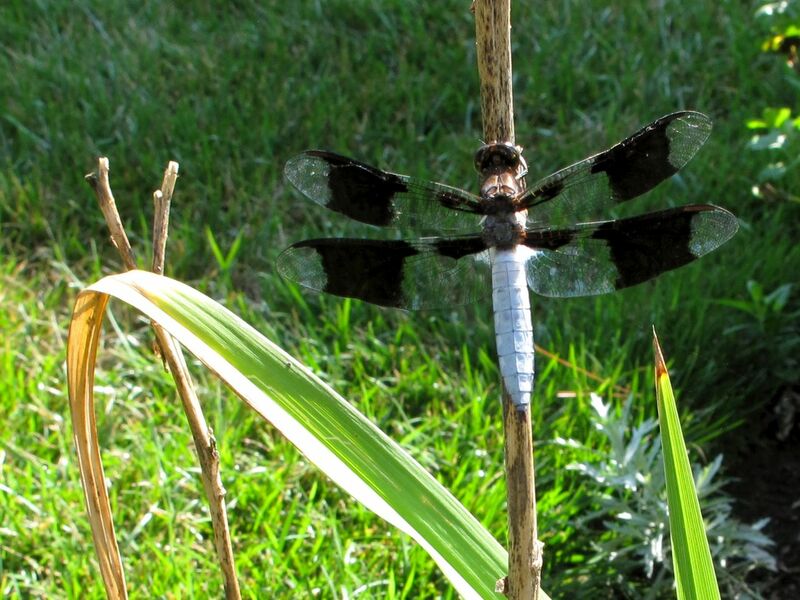 I’ve seen only a couple of dragonflies this summer and was glad this one came by when it did. Great shots! An interesting looking dragonfly and Zinnia. Thanks. I tired to ID the dragonfly but couldn’t narrow it down. Haven’t seen many this year. I love the euphorbia and the dragonfly! Thanks Ann. 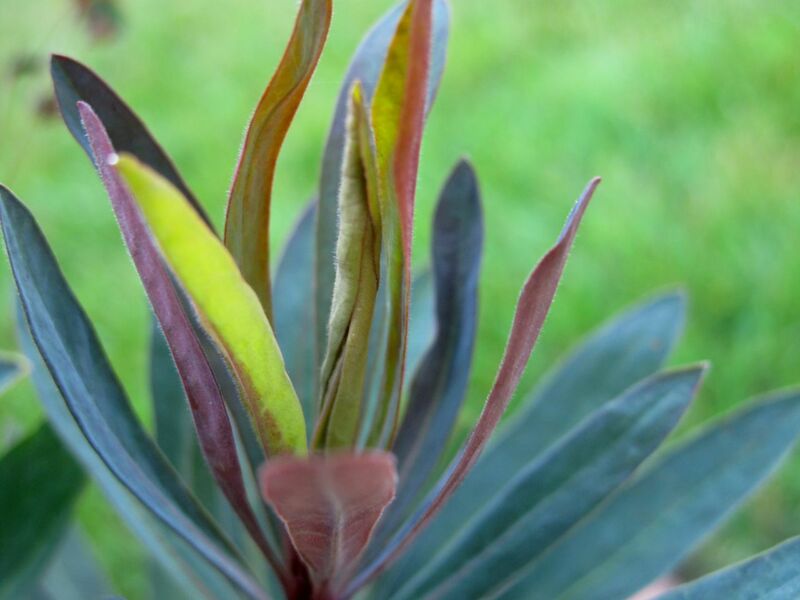 I took a lot of photos of the euphorbia that were very abstract. The colors didn’t seem believable. 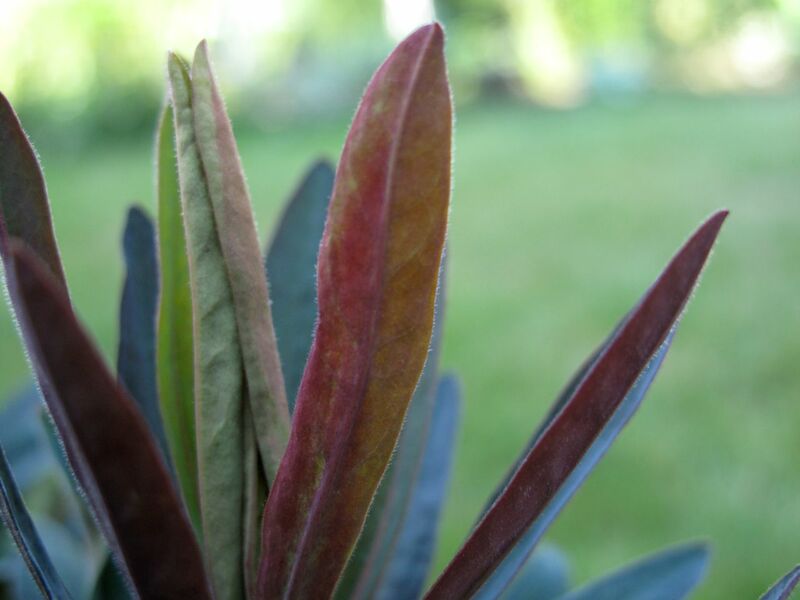 Its good that your Euphorbia has survived, the leaves are a beautiful colour. Cracking shot of the Dragonfly Susie, it looks very unusual, those chance encounters are quite special. I’ve had that Euphorbia several years now and certainly would have had to run out and replace it had it not survived. I’m still happy about the dragonfly encounter Julie. Love the foliage of the Euphorbia and I always adore the flowers of that salvia! The saliva is doing rather poorly this sumer, only a few stems have bloomed this year.